What are moving averages? And why is it so important for Trading? Moving averages is quit known technical indicator that’s been used in the trading world by many successful professional traders. Moving average is the average price movement of an x numbers of bars. In this section you will learn what a SMA and what an EMA is. And you will learn how EMA’s provide you an opportunity to make money. 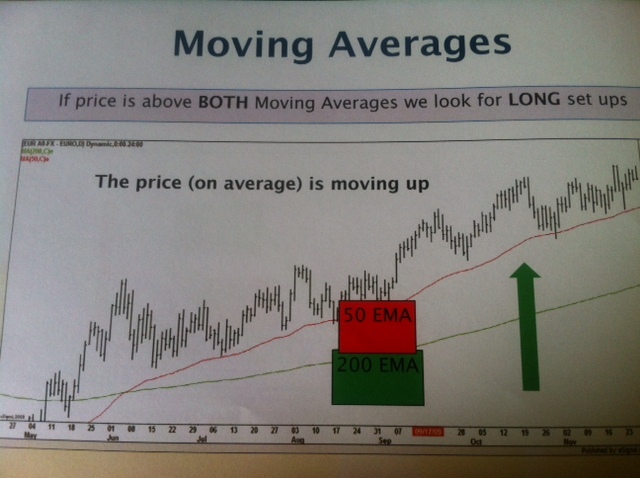 What does a moving averages tell us? 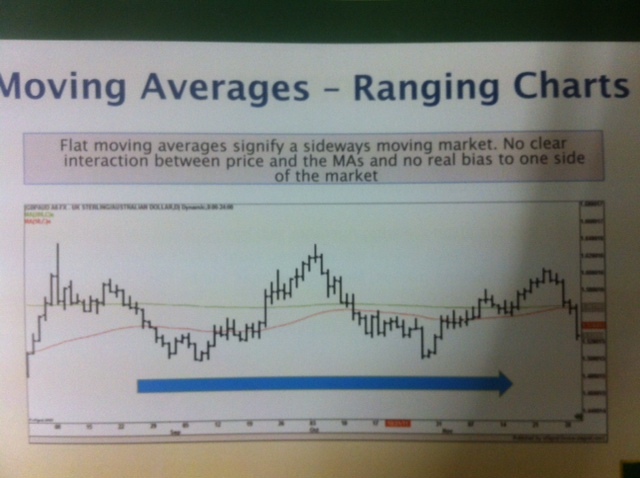 Moving averages indicator tells us whether the price, on average is moving up or down. The moving averages indicator can clearly indicate us what the current trend is. Some traders are using moving averages indicators to identify support and resistance levels in their trading. We at 101trading.co.uk don’t identify support and resistance levels with moving averages. As the MA (moving averages) doesn’t identify clearly the price levels of a support and resistance lines, it only show us the zones of it. How can you make money in trading with using the moving averages indicator? Before we answer you that question let us first explain what a SMA and an EMA is. SMA stands for simple moving average and EMA stands for exponential moving average. The difference between an EMA and SMA is that the recent price change has more effect on EMA then SMA. The reason for that is that the calculation formula of EMA is has more weight on recent price changes then a SMA calculation formula. That’s why we at 101trading.co.uk prefer to use EMA. The two main uses EMA’s for identify a trend are the 50 EMA (average of the last 50 bars) and the 200 EMA (average of the last 200 bars). The 50 EMA is being used often to determine a trend on medium trend and the 200 EMA is often being used to determine a trend on the long term. The benefit of using multiple EMA’s is that it gives you a more accurate picture of the trend. Most common EMA’s used are the 20 EMA, 50 EMA, 100 EMA and the 200 EMA. The bigger the separation between these EMA’s become, the stronger the trend becomes. How to make money in trading by using EMA’s? 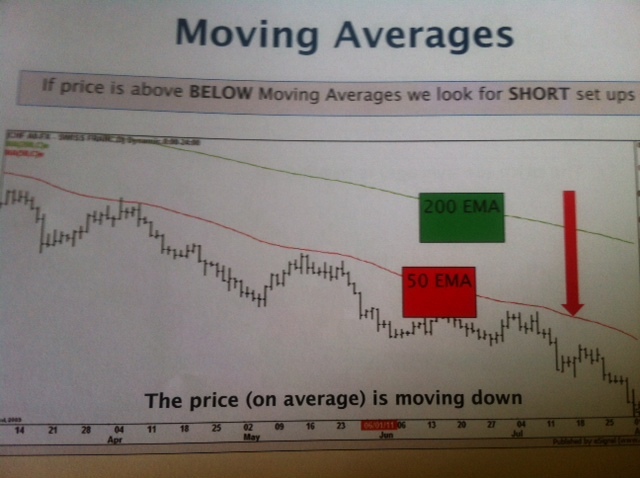 When the markets are bearish the prices usually move below the moving averages of 200 EMA and 50 EMA. In this case you can make money by going short or buying put options. When the markets are bullish, you will see that prices are moving above the 50 EMA and 200 EMA. In this case you make money when you buy the security or make more money by trading in the CFD’s of the security. When the moving averages are moving flat it signify that market is moving sideways. With this movement you can only make money by writing options. Learned enough? Sign up for free and start trading now. Litecoin’s Development: How Did it Perform This December? What is a forex signal? * Trading can be risky. You should consider whether you can afford to take the high risk of losing your money.